Sheesham (or shisham) is a decorative Indian rosewood tree, which primarily grows along the roads and river banks in the Punjab. After teak, sheesham is the most important cultivated timber of Bihar. The finest cabinets are made from sheesham, and it’s also the wood from which ‘mridanga’, the Rajasthani percussion instrument, is usually made. In addition to musical instruments, sheesham is used for plywood, agricultural tools, flooring, as a bent wood, and for turning. 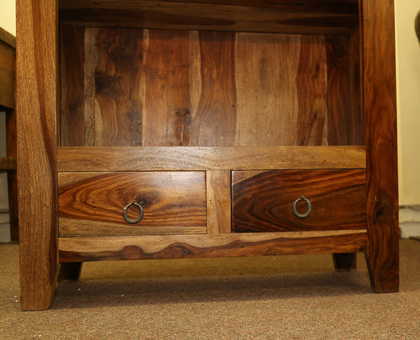 Due to its strength and beautiful grain, sheesham makes lovely furniture. The grain (including knots) and colouring can vary so much from one piece to the next, making each piece of furniture unique, so we suggest that you contact us for more images of each of our sheesham items before purchasing, as some people prefer a smooth and clean look, while others prefer a more rustic and natural feel! Take a look at our stunning ‘Sheesham Wood Indian Furniture’ here. This entry was posted in Style and tagged Sheesham Wood Indian Furniture.